I actually think my writing looks nicer as a font than it does hand written. Possibly it's the consistency, or possibly it's because I was a little more careful than usual and picked the nicer looking iterations of my letters. This exercise also made me realise the extent to which my handwriting is really just a bastardised form of the Victorian Modern Cursive I learned in primary school. Specifically, with all the 'hooks' used for joining it up neatly sliced off. I remember that being a conscious decision at one point - I tried it without the hooks one time and thought it looked much neater, and I guess that thought sort of folded itself into my writing. This is probably why I still can't do joined up writing very well. It also made me realise that my writing is a lot less neat than I think it is. The Process The first step was un-borrowing my graphics tablet from a friend. While it's possible to write them out on paper and scan them in, that would've made a fairly arduous process much more so, since a) my laptop doesn't work with the scanner, so I'd have to scan everything in one letter at a time on someone else's computer, and b) I would then have to trace, using a mouse, every single letter. 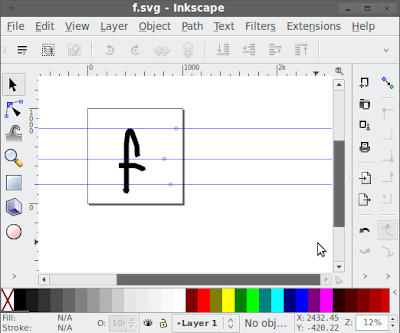 Next I fired up Inkscape (which, if you didn't already know, is a brilliant free vector graphics program) and set up what basically amount to the dotted thirds that primary school kids use to write on. It's a really powerful program, and not exactly noob-friendly, but the documentation is good, and I don't honestly need all that much from it. I get it to set up the metrics and basic kerning automatically (since I'm not really fussed about it) and tweak the sizing a bit, ignore the warnings it throws about my font not being standards- compliant, and export it, and install it. 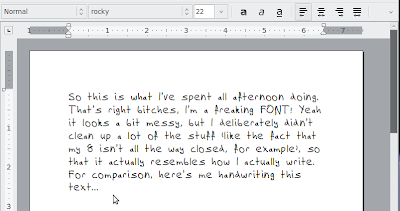 If you too have nothing better to do you too can write in my writing, by downloading and installing the font file. 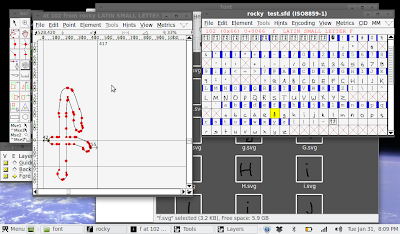 For added kicks, set it as a system font, and watch my messy scrawl take over your title bars. Alternatively, you could have a life.